We suggest five ways in which biology departments can improve their hiring processes in order to achieve gender equity in their workforce. By Christiana J McDonald-Spicer, Benjamin Schwessinger and Susan Howitt. Gender equity remains a problem in many subjects in universities. In biology, for example, undergraduate cohorts have been gender-neutral since the mid-1980s, with female students outnumbering male students on many campuses (Luckenbill-Edds, 2002), but only about one fifth of biology professors in the United States and Australia are female (Figure 1). The lack of gender equity needs to be addressed at many levels: here we discuss how individual departments can reduce gender bias when hiring and promoting staff. We propose five actions that biology departments should consider implementing in their recruitment processes. While not all proposals will be applicable to every department, we suggest that they are all discussed extensively to ensure a shared understanding of the issues and to find the best method for improving gender equity. Aim to maintain the percentage of female group leaders in the range 40–60%. When the department moves outside this ratio, advertise gender-specific positions (for example, open only to women/non-binary people only) until it returns to within these limits. Expect all staff to take an implicit bias test and/or unconscious bias training. Have one person on all selection committees whose role is to challenge potentially biased statements (it is easier to recognise unconscious bias in others than in yourself). Reconsider the selection process to better reflect a broader range of activities, with a commitment to improved evaluation of activities that are difficult to quantify, for example, mentoring, leadership in teaching, service and science communication. Focus on research quality, not quantity (see below for more details on this proposal). Recognise that equal opportunity is not just a gender issue and ensure that fair consideration is given to people of colour, LGBTQIA+ people, people with a disability, people from working class backgrounds, and those from culturally and linguistically diverse backgrounds. Here, we discuss some of the evidence that supports these proposals, and focus on how they can be implemented via two actions: introducing identified positions, and redefining merit. An identified position is an advertised position open only to people with a certain characteristic – in the case of gender equity, women and non-binary people – with the aim of increasing their representation. Several Australian universities, including the University of Adelaide, the University of Melbourne and the Australian National University, have recently advertised women-only positions in STEMM fields. In the Netherlands, the Delft University of Technology has introduced Delft Technology Fellowships for female researchers at different career stages in all of the fields of research covered by the university. Ideally, increasing the representation of women through identified positions is a short-term solution that will allow a ‘critical mass’ of women in senior positions to be reached, making these measures unnecessary. For example, mixed-gender review committees promote men and women at equal rates while those comprising only men are less likely to promote women (De Paola and Scoppa, 2015). The two main issues with identified positions are interrelated. There is a concern that any successful hires may be viewed as ‘tokens’ and marginalised (Wallon et al., 2015). Any such stigma would have to be addressed based on the organisational culture. Colleagues may also be concerned that underqualified people will be hired over others more qualified or with greater ‘merit’ (Wallon et al., 2015). Merit is rarely explicitly defined as most academics are confident that they can identify strong performance and are committed to maintaining excellence in their departments. However, stating that appointments are made on merit and there is no need for action ignores a large body of evidence to the contrary. When an organisation is explicitly presented as meritocratic, managers favour male employees over equally qualified female employees by awarding them larger monetary rewards (Castilla and Benard, 2010). In general, women are perceived to be less suited for science positions (Moss-Racusin et al., 2012), and are often criticised for showing signs of leadership praised in men (such as competitiveness or aggression; Rudman, 1998). 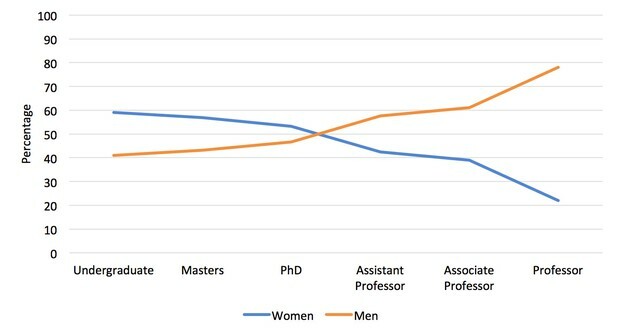 Despite this, research has found no difference in academic ability or performance between men and women (O’Dea et al., 2018). In addition, the current definition of merit used in academia often emphasises career paths that are more typically masculine. For example, research achievements may be measured by the number of papers published. This may disadvantage women: firstly, because men take fewer career breaks than women (who are often expected to take on all caring duties); secondly, men publish at a greater rate than women (Symonds et al., 2006); and thirdly, men are more likely to be assertive and effective at self-promotion (Rudman, 1998). Citation counts may also be used to measure research impact. Papers authored by women generally have fewer citations (Larivière et al., 2013), most likely due to a combination of implicit bias and differences in self-citation; men are 56% more likely to self-cite than women (King et al., 2017). Student evaluations of teaching are another metric used to assess merit. However, these are significantly biased against women, with students rating female teachers lower on every aspect of teaching, including ‘objective’ measures like how soon assignments are returned (Boring et al., 2016). This is exacerbated when the teacher is a woman of colour (Pittman, 2010) or LGBTQIA+ (Ewing et al., 2003). Academic service achievements may be overlooked during hiring due to the difficulty of measuring these contributions objectively. Women, particularly those from other minority backgrounds, spend more time mentoring and on other academic service work than men (Misra and Lundquist, 2015). Time spent on this essential but ‘invisible’ work means there is less time available for these academics to spend on work that is valued in hiring (Guarino and Borden, 2017). This evidence leads to the conclusion that the selection process for academic positions needs to be reconsidered. Research quality, rather than quantity, should be the most important factor. One method is to ask applicants to identify their best papers, an approach being increasingly used. Alternatively, applicants could be asked to provide a research narrative that explains their goals and impact, as is currently required for Australian Research Council mid-career Future Fellowships. There is also a need to recognise and reward less measurable activities that also contribute to academic work, such as excellence in teaching, contributions to service, mentoring and outreach. We recognise that gender equity is only one form of equity that academia struggles with. For example, people of colour, LGBTQIA+ people, people with a disability, people from culturally and linguistically diverse backgrounds and people from working class backgrounds are all underrepresented in science. This is exacerbated when individuals belong to more than one marginalised group. It is important that these identities are acknowledged and considered in hiring processes, particularly considering the diverse student body in biology, many of whom lack a clear role model in academia. By promoting equity and addressing bias in the selection process, hopefully diversity across these areas will also increase. We thank our colleagues at the Research School of Biology, The Australia National University – particularly members of the Equity Committee – for helpful discussions and comments on the article.